I've always kind of avoided it, but you make it look so polished--I might have to give it a go! I totally rock the sock bun whenever I can. Doing my hair up any other kind of style never looks as polished - and it takes me all of two minutes in the morning. Brush. Roll sock. Tie up in elastics. Bobby-pin the bangs back. DONE! As a personal trainer, a natural brunette who likes to be blonde, and a person who works out 6 days a week, my hair only gets washed 2-3 times a week.. there's just no point in washing it more than that because it's just half sweaty all the time, haha! I live by sock buns, or "donut buns", after day 2 of no wash. Believe or not, my husband thinks they're adorable, for whatever reason! Haha they're more functional than cute on me, or so I think, but I'm definitely for them! Do you do it as slicked back as mine? I bet you rock it! I haven't worn it in a non-military fashion quite yet, but I'm considering it now since it's so easy! I know! At least someone knows what I'm talking about -- and not just from a military standpoint. It's SO EASY!!! OOH I love the up-high slicked-back. So cute. I bet it looks great on you! Aren't you just the cutest! I love this look on you! Aw Kelly, you're sweet!! Thanks! Julie! I wore it yesterday as a low, loose bun. I LOVED it! Glad I took your recommendation to try it! 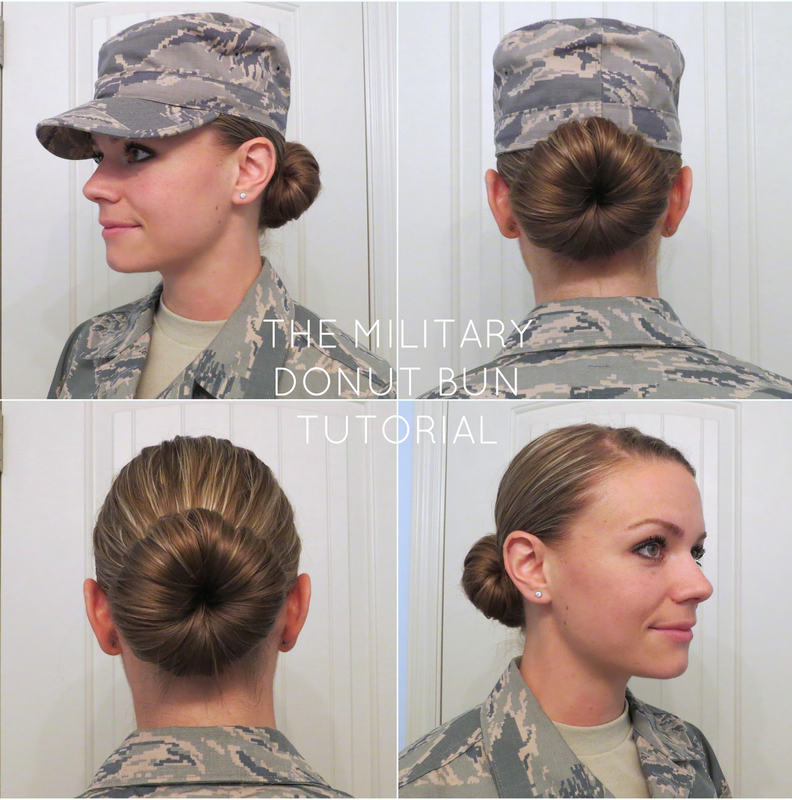 Do you get in trouble from your TI for bringing the donuts to basic? I know you're really only supposed to bring what's on the BMT list but I'd like to be able to bring them with. My hair will be out of control without then.